"I've been through a storm with a beer with no name." (With apologies to Dewey Bunnell and the band America.) Sorry, couldn't resist, but that tune, with altered lyrics, was playing in my head as I enjoyed the Single Hop HBC-431 from Flying Dog during our latest winter storm earlier this week. According to the brewer, "HBC-431 is a hop so new, it doesn’t even have a name. It’s an experimental variety from a cutting-edge hop supplier. With a unique combination of melon, tropical fruit, stone fruit, pine and earth notes, our head brewer said it’s unlike any beer he’s ever been with." The beer pours a deep golden color with a persistent head. The aroma has strong tropical fruit notes with hints of pine. It's a unique change from the citrus or sweet-forward aromas usually found in Double IPAs. The flavor continues the same tropical, citrus fruit theme, but with more pine and biscuity notes. The flavor is not all that sweet but there is a bit of a syrupy aspect. Overall this Imperial IPA is well-balanced and richly flavored. 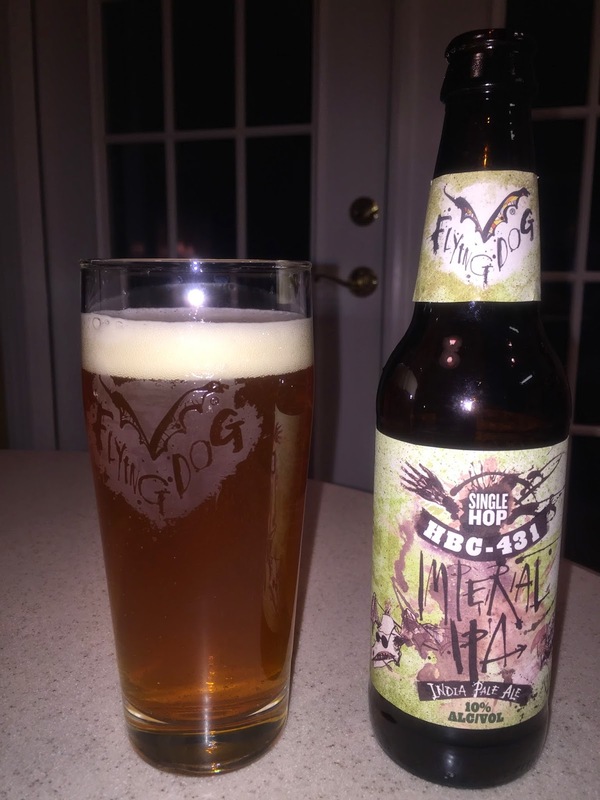 Single Hop HBC-431 is the first of the Single Hop Series from Flying Dog in 2015. I've enjoyed quite a few of the previous releases, and this one is no different. It does seem more balanced than some of the others, and despite the reliance on a single hop for flavoring, offers a broad palette of flavors. We should look forward to seeing more beers that make use of the HBC-431 hop. The beer reviewed here was a promotional sample from the brewery. My impressions are provided of my own free will.